It’s that time of year again as the masses gather to celebrate urban hip hop arts and culture in Ottawa. House of Paint started in 2003 after the establishment of Ottawa’s first Free Zone for graffiti art under the Dunbar Bridge near Brewer Park. In its 12th yeah, HoP digs deep to bring together prolific artists in the form of MCs, graffiti artists, visual artists, dancers, DJs, poets, and much more. It’s difficult to think of anywhere that one can feel a sense of community better than under that bridge during House of PainT. This year you can expect the usual happenings – bboys and bgirls doing their thing, MCs spitting rhymes, DJs filling the air with beats, panels, workshops for people of all ages to learn more about hip hop culture, graffiti and mural art. You know, the usual. However, there will be an addition to the festival this year. 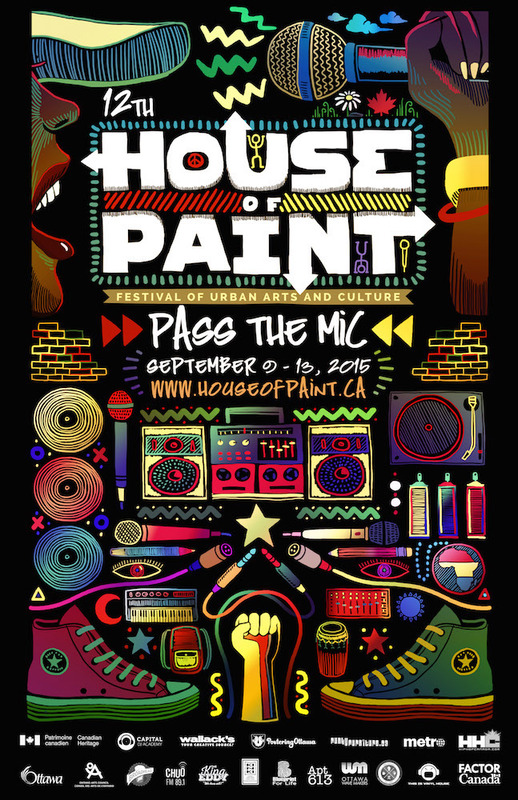 First, The Ottawa Beat League is bringing Beat Battle 3: House of PainT Edition is taking over Babylon on Day 2. This electronic beat-making competition takes place over three rounds and tests the skills of producers and beatmakers. It also includes performances courtesy by Raz Fresco (NYC), City Fidelia (TOR) and Circabeatz (OTT). Later that night the annual OG 500 Poetry Slam competition will take place and take us deep into the night, headlined by Montreal Métis poet Moe Clark. These exciting new additions demonstrate how HoP continually adapts and finds new ways to celebrate hip hop. Learn more about the festival and its history here. To view full HoP Schedule, click here. Performances by Pruf Rock (Canadian spoken word champion), King Krook, DJ Illo, a special dance performance and live painting by Kalkidan Assefa. Introduced in 2012, the OG500 is the now most anticipated poetry slam event of the year and is famed for its unique live voting format which creatively engages the crowd. Words, wits and theatre are put to the test in an intense three-round competition between poets from all over Canada, followed by a renowned feature artist. Look no further than the OG500 Poetry Slam to kick off the weekend with word, sound and rhythm. Featuring rap performances by Raz Fresco and City Fidelia. A special beat showcase by CIRCA Beatz. OBL has teamed up with House of Paint to bring you a new instalment of the OBL Hip Hop Beat battles. It is a quarterly hip hop beat battle competition. Showcasing some of the City’s finest beat makers in a 3 round challenge, we aim to provide a platform for producers to be able to flex their skills and gain recognition. Friday nights are a long-time favourite at HoP. Featuring preliminary rounds of the recently introduced 1v1 popping battle, opening of the Arts Market, and a number of performances by high profile MCs and DJs, join us under the bridge to Rock The House! Performances by Black Moon (Buckshot & DJ Evil Dee), Demigodz (Apathy & Celph Titled), Your Old Droog (w DJ Skizz), Buck N Nice, VNCHY, Moun Fou, Jonathan Emile. Today it all goes down- the four elements are live all day with music performances, a variety of children’s activities and workshops, and concession stands selling art, clothes, crafts and food. Under the bridge, 60+ graffiti artists paint live on Ottawa’s first legal graffiti wall; the top four finalists of the 1v1 popping battle and dance crews from all over Canada battle for the Grand Prize. Our Main EvenT is not to be missed! Performances by Jazz Cartier, BlakDenim, Kalmunity Collective, Flight Distance, Socalled & Narcy Emotionz (w DJ Praiz and Sirreal), Dee Ghabrial. DJs / Live Beats by Kool Krys, DJ Magnificent, DJ Mace, DJ Eazy El Dee, DJ Mel Boogie, Trevor Walker, Capital DJ Academy, DJ Memetic, DJ Zattar. Visual Arts – 60+ Graffiti writers paint live through the day – Individual and crew productions Mural wall installations Art gallery / Solid Goods Artisans Market. BBoy / BGirl Prelims, Semi-Finals and Final Battle Popping Semi-Finals and Final Battle. Since the first Knowledge Conference in 2013, this series of learning events allows HoP to gather cultural innovators and professionals to learn and network in a community of artists. Including panel discussions, master classes, workshops, a keynote speaker, and a wind-down networking evening, this year will feature sessions for professional development of Hip Hop music professionals. The focus will be on professional development for entrepreneurs, mentorship, and how to attract paid opportunities.